Cheryl Tipp, Curator of Natural Sounds at the British Library, previews the first week of Noise: A Human History. 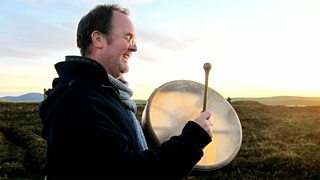 The thirty-part series, which begins on Monday 18 March, explores the role of sound in the past 100,000 years of human history. There are countless ways in which sound has played, and indeed still does play a role in the shaping of human history. Working with David Hendy on Noise: A Human History has given us the opportunity to share some of the often unique recordings that make up the world-renowned sound collections at the British Library and to show how they contribute to that story. We kick off the series by looking at our earliest relationships with sound. From prehistoric caves to the pounding rhythms of talking drums, these first five episodes examine the importance of sound in our distant past when our ancestors were just beginning to learn how to manipulate the acoustic world. One recording from our collections featured in episode two of Noise is of the vervet monkey, whose alarm calls were part of research that changed our understanding of this species' vocal communication system, and showed us something of how animals, much like early humans, use noise and warning sounds to stay alive. Three different alarm calls used by vervet monkeys to warn of specific predators. By analysing their calls, Drs Robert Seyfarth, Dorothy Cheney and Peter Marler discovered that these were not in fact generic alarm calls but in fact highly specific indicators containing information that told other individuals in the group exactly what type of predator to beware of. This signal would then inform the subsequent evasive behaviour. Playback studies showed that the "snake" alarm call would cause the group to stand up and study the ground, while the "eagle" alarm call would see them dive into bushes or the middle of trees where an aerial predator could not reach them. The "leopard" alarm call on the other hand would send individuals scuttling up to the very tops of the trees. Most of the wildlife and environmental recordings - which are my specialism - that feature in Noise are from unpublished collections and are being heard by a radio audience for the very first time. From these monkey calls recorded by scientists to amphibian choruses captured by a Canadian truck driver on his days off, all these recordings have a story to tell. It has been a fascinating journey for us involved with the making of the Noise series and as the weeks continue, we hope that curiosity will be sparked and that questions are asked about just what sound means to us all.